Scot set out to appease the critics and improve the design, and his resulting Heraldic eagle reverse motif was based on the bird gracing the Great Seal of the United States. This design is called Heraldic because it is the stylized supporter of the nation's shield, much as the lion and unicorn support the British coat of arms. Scot's version combined a chicken-like head with a body wide enough to hold the thirteen-stripe shield. The upraised wings are thin, partly covered by a flowing scroll inscribed E PLURIBUS UNUM. Clouds overhead frame thirteen to sixteen stars-symbolizing the original states and three new ones formed after independence. Scot blundered in one respect, however, apparently forgetting that directions are reversed in heraldry, which regards the eagle as if it were a person facing the viewer. The eagle's right or "dexter" side is therefore the viewer's left or "sinister" side. Thirteen arrows are in the eagle's right claw, an omen of war. This oddity continued until the series ended in 1807. Comprising only ten dates, the series is rich in history and rarity and includes three early dates long steeped in mystery. Although Scot did not cut the Heraldic eagle reverse dies until early in 1798, strangely enough it exists with obverses dated 1795, 1796/5 and 1797. The first 1798 dies used with the Heraldic reverse had a large 8 in the date and thirteen reverse stars. The shield bears six "red" stripes composed of five lines each. This system of showing color by raised engraver's lines was a code created by 16th century engravers to show colors in elaborate coats of arms that could only be printed in black and white. The next dies showed a large date with shield stripes made up of three raised lines each. Above were fourteen stars, soon revised to only thirteen at the order of the third Mint Director, Elias Boudinot. These stars are found in either an arc or a cross pattern. Small date 1798 coins finish the year's mintage, which totaled only 24,867 of all varieties. Only 7,451 coins were reported for 1799, including pieces with a large final 9 and either large or small stars; and a large recut 9 with stars large or small. Coinage of 1800 comprised 37,628 pieces, but many of these are believed to have been dated 1799, while additional coins were struck during 1801 with still other dates. The steel-starved Mint used any available dies for as long as they were serviceable. Although 1801 dies were prepared, no coins were struck from them. This date exists only in ghostly form as the next year's 1802 over 1 overdate! All 1803 coins are also overdates, properly called 1803/2. What then of the Heraldic eagle coins bearing the dates 1795, 1797 and 1797/5? To understand these enigmatic issues, it is necessary to recall the annual epidemics of yellow fever that prostrated Philadelphia in the late summer and early autumn months. At the end of the 18th century, Philadelphia was still the second largest city in the English-speaking world, largely recovered from the destruction of the Revolutionary War and the British occupation, but helpless against mosquito-borne epidemic disease. Yellow fever drove the wealthy into the countryside, while the poorer classes grimly awaited the scythe of fever to sweep the city. These annual outbreaks wreaked havoc with the Mint's production. When the second mint director, Henry William DeSaussure, stopped half eagle coinage in September, 1795 to concentrate on eagles, the still usable 1795 half eagle dies were stored away, one of these redated as 1796/5. After the 1796 yellow fever epidemic, a 1797 die was created and used with the proper Small Eagle reverse. In the frantic scurrying of the 1797 fever, all these dies were locked away in the strong room of the Bank of the United States while the Mint closed down completely. After the Mint resumed operations in the early months of 1798, sudden demand for half eagles led to the muling of these older dies with Scot's new Heraldic Eagle reverses. The new reverses were pressed into service with the now lightly rusted 1795, 1797/5 and 1797 obverses to create the mysterious "combination" coins that are so rare today. Perhaps as many as 316,867 Heraldic Eagle $5 gold pieces were struck at the Philadelphia Mint between 1798 and 1807, though the lack of precision in early Mint records makes this total an estimate rather than a concrete fact. No proofs exist, though the softness and ductility of gold coupled with Mint attention to detail did create some extraordinary "presentation" coins of uncertain purpose. Gold coins from this period were all but ignored by early collectors. The late Walter Breen first examined this denomination's die varieties in his pioneer Early U.S. Half Eagles, published in Numismatic Scrapbook in 1966. Collectors today primarily pursue only one example of this design for "type," as few can afford to assemble either complete date, or date and variety collections. All dates are scarce to extremely rare in any grade. The 1797 with sixteen star reverse is unique and is now part of the Lilly Collection in the Smithsonian, forever off the market. Along with the remaining two "backdated" coins, other rare issues are those of 1798 and 1799. The 1806 is the most "common," particularly in high grade. Uneven strike sometimes resulted in weakness at the centers of this design, and actual wear may first appear on the locks behind the ear or on the forehead, eagle's outer wings and on the clouds, rather than at the ear or shield. In 1807, the new mint director, Robert Patterson, appointed German engraver John Reich as assistant to Scot. Reich's first assignment was to improve the coinage designs. 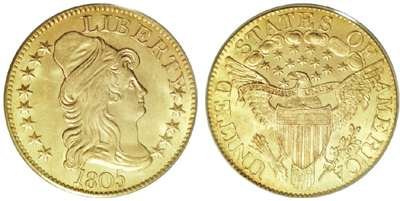 Six months after his arrival, the new half eagles appeared, this time with a capped bust of Liberty facing left, and a new reverse with a more natural and peaceful looking eagle. BIBLIOGRAPHY: Akers, David W., United States Gold Coins, Volume IV, Half Eagles 1795-1929, Paramount Publications, Englewood, OH, 1979. Alexander, David T., DeLorey, Thomas K. and Reed, P. Bradley, Coin World Comprehensive Catalog and Encyclopedia of United States Coins, World Almanac-Pharos Books, New York, 1990. Breen, Walter, Early United States Half Eagles, 1795-1838, Hewitt Numismatic Printers, Chicago. Breen, Walter, Walter Breen's Complete Encyclopedia of U.S. and Colonial Coins, F.C.I. Press/Doubleday, New York, 1988. Miller, Robert W. Sr., United States Half Eagle Gold Coins 1795 to 1834, B.C.&C., Elmwood Park, NJ, 1997. Vermeule, Cornelius, Numismatic Art in America, The Belknap Press of Harvard University Press, Cambridge, MA, 1971.